Animal organs. Cardiovascular system. Capillaries. Atlas of plant and animal histology. Organ: A, B) uterus wall, C) thick skin, D) spinal cord. Capillaries. Technique: A, B) paraffin embedding, sections stained with haematoxylin - eosin, C) paraffin embedding, sections stained with Masson trichrome; D) paraffin embedding, sections stained with haematoxylin - eosin. Capillaries are blood vessels with the smallest diameter, just a few micrometers. They are made up of squamous non-stratified epithelium, referred as endothelium. The other component of capillaries is the basal lamina, a layer of distinct extracellular matrix located between the endothelium and the underlying connective tissue. The very low thickness of the endothelial cells makes possibles a feasible interchange of molecules between the blood and the surrounding tissues. Capillaries are arranged in nets to completely irrigate the organs. Endothelium performs many functions. It is involved in thrombosis, thrombolysis, platelet adhesion, vascular tone and blood conduction. Furthermore, leukocytes need to be attached to the endothelium before leaving the blood stream toward other tissues. Endothelial cells release many signaling molecules targeting different types of cells. The capillary net is maleable and it can change according to the organ and tissue demands. Therefore, proliferation of endothelial cells and their arrangement in capillaries are under the control of external signals. This plasticity is essential for repairing damages in tissues and organs, and during embryo development. Angiogenesis is the formation of new blood vessels from preexisting ones and the new endothelial cells are originated by proliferation and differentiation of already present endothelial cells. Electron microscopy picture of capillaries. A) Transverse view of a capillary. The nuclei of endothelial cells are observed. B) Many endocytosis vesicles (arrows) are visible in the cytoplasm of the endothelial cell. C) Scanning electron microscopy image showing afenestrated capillary. The little black spots are the openings of the channels that directly communicate the interior of the capillary with surrounding tissues. Almost all cells of the body are at a distance of about 50 to 100 µm from a capillary. It means that cells in growing organs should release molecular signals for the development of the capillary net (angiogenesis), i.e., new branches and longer vessels. Vascular endothelial growth factor (VEGF) is a molecule that promotes the formation of new capillaries. It is important to know how the molecular mechanism of angiogenesis works to understand, for example, the development of tumors, since angiogenesis is needed for the increase the tumor size. Is there is no angiogenesis, the internal cells of the tumor will die by starvation or by lacking of oxygen as the tumor grows. Pericytes are cells associated to the internal wall of capillaries (that which is not in contact with blood). They can regulate the capillary diameter, and therefore the blood flux, due to their ability of contraction. 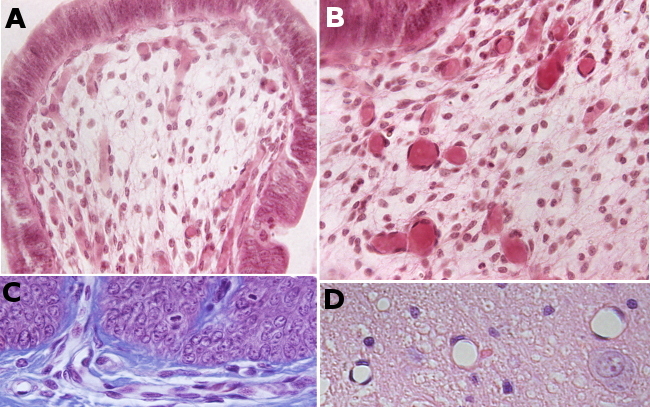 Perycites arise from differentiation of messenchymal cells located near the endothelial cells.